This past weekend my hubby and I experienced the most magical time together at the "Get the love you want" workshop by Dr Harville and Helen LaKelly Hunt with about 70 other couples. When I say it was life changing, even that feels like an understatement. There were tears, struggles, stories shared, belly laughs, dancing and even singing. All in the most serene, breathtaking, and calming location by the sea, the Esalen Institute in Big Sur, California. The glorious sunrise I experienced on my first day at the Esalen Institute for the couples workshop. How did I hear about this event? If you know me well, then you know I am a huge fan of Marie Forleo and am obsessed with watching Marie TV. Of course, I am on her email list, and when this header popped up in my inbox, I was intrigued: Relationship problems? This is Magic! Now you might be wondering why this grabbed me and if everything is okay with my husband and I. The answer is yes and no. As many of you can probably relate, my hubby and I struggle with being extremely different and this can cause a lot of friction and result in a break down in our communication, disconnecting us. This became even more challenging as we started to grow our family. From our personal childhood experiences, we realize that if the relationship is not healthy, over time it can lead to unintended consequences for the partners and their family. This could look like two people dancing around conflict, fights like hail storms, negativity, resentment, anger or even divorce. After listening to the interview with Marie, Harville and Helen, I was immediately convinced that Janne and I should attend one of their couples workshops as soon as possible. Not only to create a stronger connection in our relationship but also to help ensure our children learn from us what a healthy relationship looks and feels like. 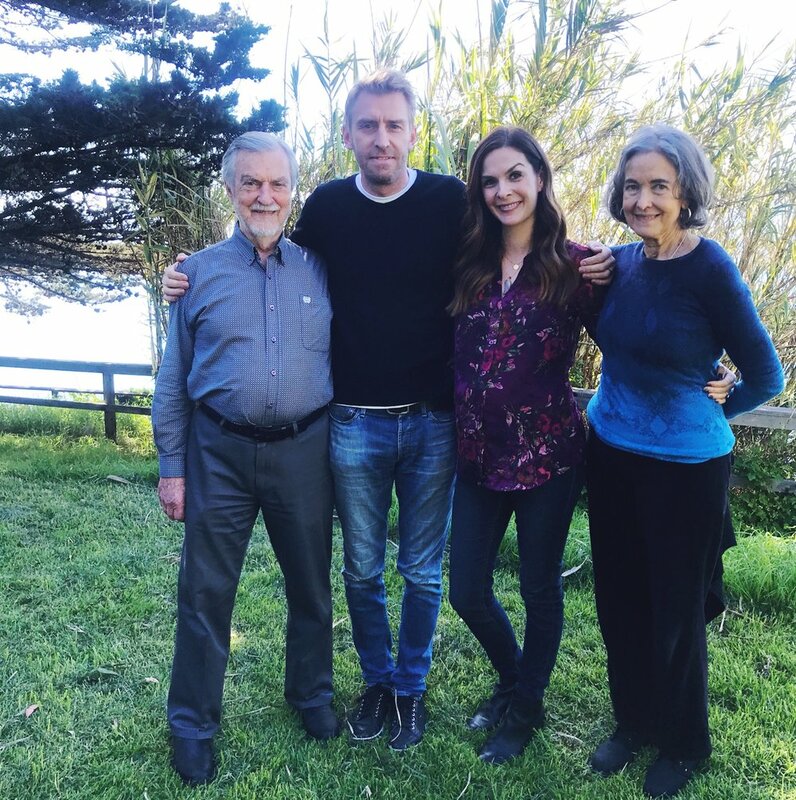 A moment with the inspirational creators of “Get the love you want,” Dr. Harville Hendrix and Helen LaKelly Hunt. What did I take away from the workshop? In fact, tolerating ambiguity is a sign of brain health. And did you know that research shows that all couples are incompatible. During the workshop I learned how to lean into these “differences” and find comfort in knowing that they will lead to the most growth in our relationship. The tool they gave us to help is a type of communication, known as the Imago Dialogue. A three step process that creates safety in order to restore connection. These "safe conversations" require effective talking and listening skills, where you validate your partner’s views as equal to your own, while expressing empathy for their feelings as they experience their world. Ultimately, when you use this dialogue process you are moving past the power struggles created by our ego and thinking “I am right” into a place of understanding, acceptance and connection. When we come into a relationship we have expectations of what it should feel like and how our partner should behave. When they don’t meet these expectations, our lower brain reacts in defense mode often leading to judgement and criticism. When you judge, you are looking at things from your own perspective. Your brain is thinking "we are one, but I am really the one." This frame of mind creates your partner as an object rather than a person who is different from you. Rather than focus on what your partner isn’t doing well or providing you, invite yourself to wonder about your partner in a new way and ultimately wonder about the world with fresh eyes. Since our brain is orientated towards the future, we only look behind us when anxiety is present, as a measure of safety. As a result, seeing what is possible is where we prefer to be. You can work on this together by creating a vision board of your relationship and writing down in present tense the behaviors present in your ideal relationship. This vision should be printed and placed somewhere you can see it and will take daily practice. We all desire pleasure and passion in our relationships. After all, it was what you experienced together in the first place and created your initial bond or connection. At some point in our relationships these romantic feelings get lost. But the good news is that you and your partner can co-create the joyful aliveness of “Real Love” by engaging in caring behaviors, surprises and high-energy fun. First, it is important to understand the difference between appreciation and caring behaviors. Appreciation is raising your partners value - acknowledging the behavior(s) which lead to positive feelings and what you experienced as a result. Caring, on the other hand, is telling your partner "I got something from you I didn't ask for but wanted/needed and it made me feel [fill in the blank]." They are different but equally important. Do both often! Fun is important in our relationships and in life. Make a list together of how you can have more fun in your relationship. These activities should need no skills, have no rules, and can’t be done wrong. They often produce “belly laughs” and joy in our relationships. The breathtaking Esalen Institute at sunset. My high relationship expectations were leading Janne to feel judged, sad and inadequate. Ironically these are the same behaviors I resented about my parents during my childhood. And it is the exact opposite from what I experience with Janne - he is extremely accepting of me and everyone around him. Hence, this is where one of our biggest points of incompatibility begins. My goal is to discover more about Janne and be curious in my communications with him. To have more understanding of how he views the world, experiences his feelings and thinks about things. I believe practicing the imago dialogue, along with the other two areas mentioned above, will really help with this transformation. Laura at 23 weeks pregnant enjoying the purple sands of Pfieffer Beach in Big Sur. Laura’s husband, Janne Kyttanen, enjoying some time on Pfieffer Beach in Big Sur, California. I know Janne would agree with me when I say this was one of the best experiences we have invested in. Priceless for any relationship, and in fact something that should be mandatory for couples to attend at least once a year to ensure their relationship continues to develop with acceptance, joy and romance. It is crucial to do the workshop with your partner. You might have to drag them there (this was the case for a few in the room), but rest assured it will be worth it. The sad reality is not many people do anything about it until it is too late. Which leads to an astounding divorce rate in America of 50%. If you are interested in learning more about this workshop, please visit Harville and Helen’s website. It is a wonderful way to transform your relationship no matter where you are in the journey right now.